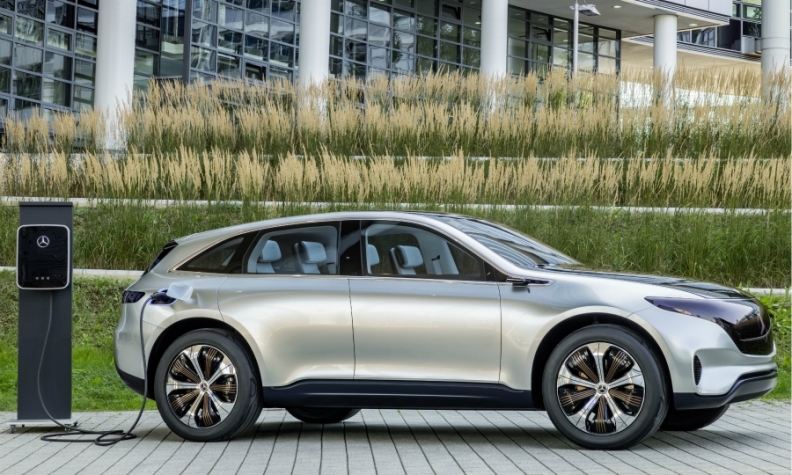 Daimler will launch the electric EQC based on the Generation EQ concept, shown, in 2019. FRANKFURT -- Daimler, owner of the Mercedes-Benz brand, warned that a fall in demand for diesel cars and a switch to electric vehicles could force it to prop up its supplier base. Automakers face increased legal and regulatory scrutiny over pollution levels produced by their diesel vehicles after Volkswagen in 2015 admitted to cheating emission tests using engine management software. To avoid a total ban on their diesel vehicles, Daimler and other automakers have stepped up development of electric cars and agreed to update their engine management software to cut down pollution levels. Daimler's suppliers are being forced to invest to help electrify the entire Mercedes range by 2022, prompting the automaker to use unusually frank language to warn about the impact of the shift to electrified cars. "Due to the planned electrification of new model series and a shift in customer demand from diesel to gasoline engines, the Mercedes-Benz Cars segment in particular is faced with the risk that Daimler will require changed volumes of components from suppliers," the carmaker said in its annual report. "This could result in over- or under-utilization of production capacities for certain suppliers. If suppliers cannot cover their fixed costs, there is the risk that suppliers could demand compensation payments," Daimler said. "Necessary capacity expansion at suppliers' plants could also require cost-effective participation," Daimler added. By 2022, the company plans to electrify its passenger vehicle lineup, offering more than 50 battery-electrics, plug-in hybrids and 48-volt mild hybrids in all sizes and segments. The first Mercedes-Benz EQC series model will come off the line in Bremen, Germany, next year. Daimler created a risk management committee to oversee its suppliers in the aftermath of the 2008 financial crisis, when some smaller companies ran into cash-flow problems, forcing Daimler to step in. Daimler said earlier this month that its profit growth would be dampened this year by spending on new technologies such as electric and autonomous vehicles. In its annual report, Daimler also said that political crises and uncertainties could lead to supply bottlenecks for specific raw materials, leading to volatile prices. "Generally, the ability to pass on the higher costs of commodities and other materials in the form of higher prices for the manufactured vehicles is limited because of strong competitive pressure in the international automotive markets," the annual report said. Daimler's report, published on Tuesday, showed that provisions stood at 14 billion euros ($17.3 billion) at the end of 2017, 2.1 billion higher than a year earlier. The automaker did not provide a detailed breakdown of the rise but said it was primarily due to increased obligations from sales transactions, provisions for warranty obligations, and provisions relating to legal proceedings. Daimler is being sued by owners of Mercedes diesel vehicles in the U.S. in a class-action suit which alleges the automaker used software to reduce emissions. Daimler views the lawsuit as being without merit, but added it could not quantify the legal risks from class-action lawsuits, the annual report showed. Among the legal risks faced by Daimler is a regulatory probe tied to raids at several car manufacturers and suppliers, with regard to steel purchasing. Daimler reiterated in its report that it was cooperating in full with the authorities. Daimler also said in its report that CEO Dieter Zetsche's total remuneration for 2017 amounted to 8.61 million euros, an increase from 7.61 million euros a year earlier.